Valentine's Day Roasted Duck with Duck Fat Spaetzle - You're Making a Mess!You're Making a Mess! Valentine’s Day is one of my favorite days to cook. It’s a great excuse to make something extravagant, while avoiding the mobbed, amateur-hour restaurant prix fixe meals. It’s a time to break out that special bottle of wine you’ve been saving, try a complicated new recipe (or dig out an old favorite), and enjoy a quiet, relaxing night and some good music. 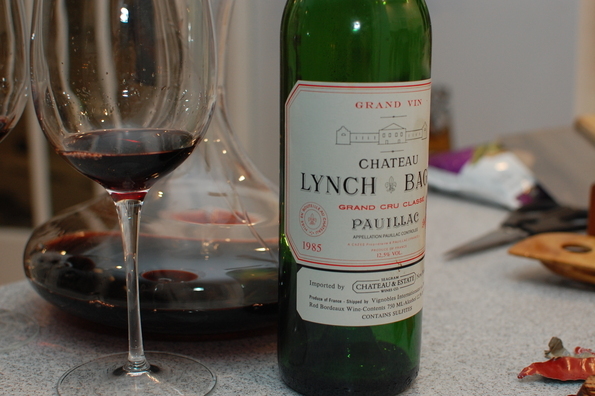 Last night, we did all but the quiet part — I opened a bottle of 1985 Bordeaux that I had gotten as a 30th birthday present, made a roast duck inspired by duck a l’orange, and took Bon Appetit’s suggestion and listened to one of Sara’s favorite albums — Rumours by Fleetwood Mac. My 4 month old wasn’t so into the “quiet” part, but he at least hung out peacefully with us for a few minutes as we ate our dinner. I don’t typically order duck in restaurants, but we had a stunning dish at Le Bouchon last year that paired roasted duck, bigarade sauce, and duck fat spaetzle with peas. The combination blew me away — the fatty richness of the duck, paired with the bright, slightly citrus-y sauce on top of crispy spaetzle left me dreaming about the meal for months. 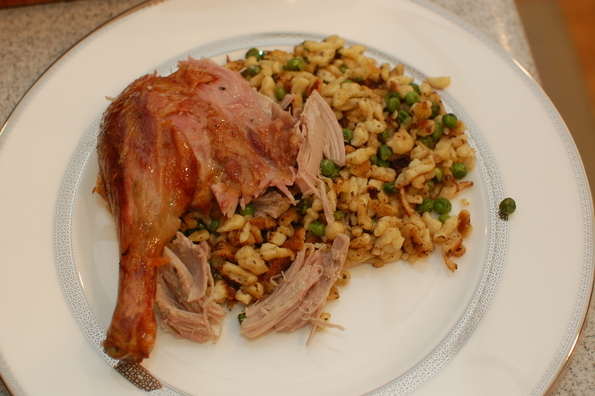 Although I’ve never made roasted duck, when we were digging around for fun things to make this year, duck with spaetzle quickly came to mind. I bought 6, but one outsmarted me and refused to be pried open! First things first — the spaetzle. I made mine earlier in the day in order to keep things a little simpler at crunch time. You can find plenty of spaetzle recipes on the web, but the ingredients are simple: eggs, milk, flour, salt, pepper. Reader of this blog will recognize my love for eggy mixtures like this — the batter is pretty similar to popovers, crepes, and Grandpa’s dumplings. Once you’ve mixed it all together and let it sit for about 15 minutes, you push it through the holes in a colander into boiling water, which gives the spaetzle “noodles” their orzo-like shape. 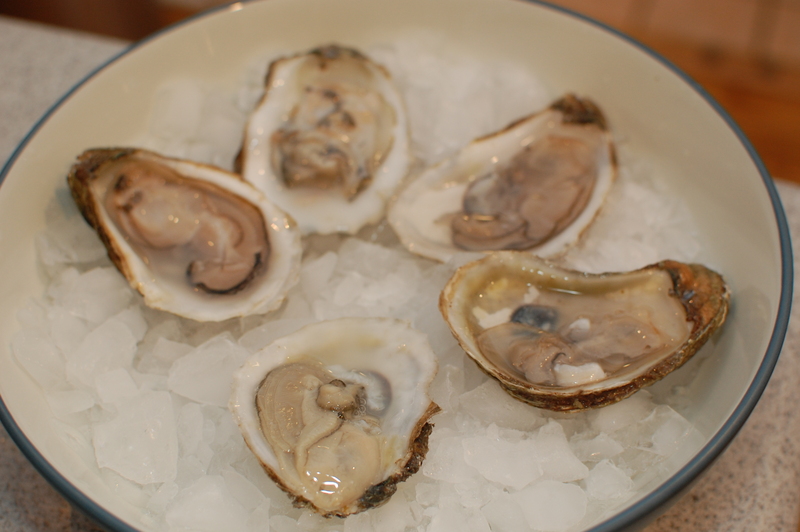 After I made mine, I tossed them with some butter and refrigerated for a few hours. Onto the duck. 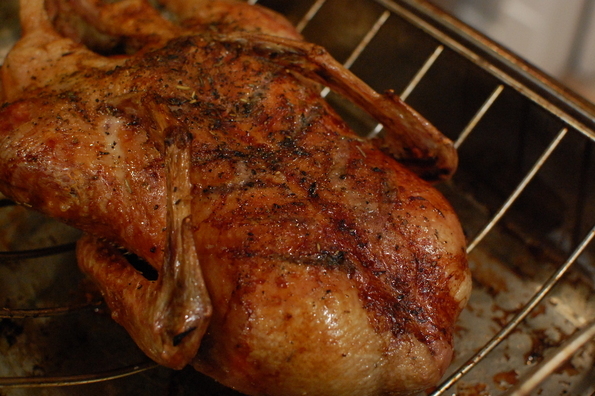 If you’ve roasted a chicken, roasting a duck isn’t too different. Recipes and techniques abound, ranging from boiling and roasting, to just roasting, to roasting low and then blasting with high heat. Whatever you do, either lightly score the skin or prick it with a fork (don’t penetrate the meat) so that the copious fat under the skin can render out — you’ll need it later. 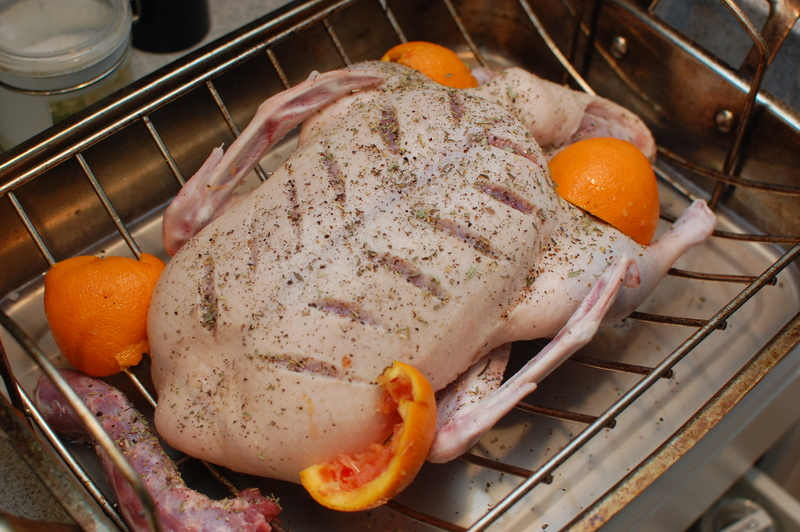 I also sprinkled mine with salt, pepper, and Herbes de Provence and stuffed the cavity with orange peels, but if you don’t have that, salt and pepper and thyme if you have it would be great. I ended up starting the duck pretty early and roasting it low at 300 for about 90 minutes then at 425 for another 30 minutes or so. You want the thighs to end up around 170 degrees, and the skin to be golden brown. If I did it again, I’d probably experiment with boiling, as it supposedly renders more fat out — but if you don’t want to fuss with that, you would get great results roasting at 400, flipping 45 minutes in, and then watching it until the skin is golden and the temperature is 170. The bigarade sauce requires duck fat, so start it after you’ve been roasting the duck for enough time to get at least 2 Tablespoons of pan drippings. I used 2T of fat and probably and extra 1T of browned pan bits — I suggest this if you have some you can scrape up. 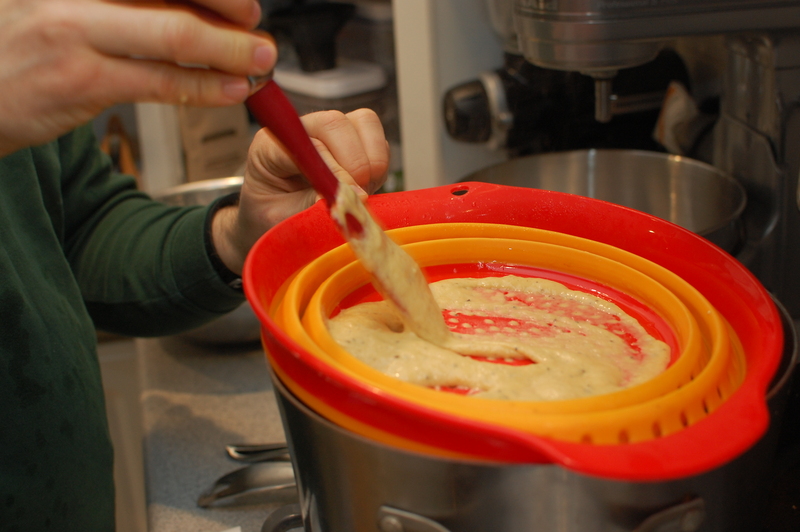 Start with the roux — slowly whisk in 2T of flour and cook it for about 4-5 minutes over low heat until it gets light brown and/or it smells “nutty” — like fresh bread. To this I added stock (I only had turkey stock, but chicken or duck stock would be even better), apple cider vinegar, the juice and pulp of a fresh orange, a small amount of sugar, and some salt. After the first tablespoon of vinegar, it seemed like it needed a bit more brightness, so I added another tablespoon. Tasting the sauce in isolation, it didn’t blow me away — but combined with the duck and spaetzle, the tangy, slightly sweet, slightly orange-y flavor worked perfectly. Finally, the best part — the duck fat spaetzle. Pour a generous amount of duck fat (and browned bits!) 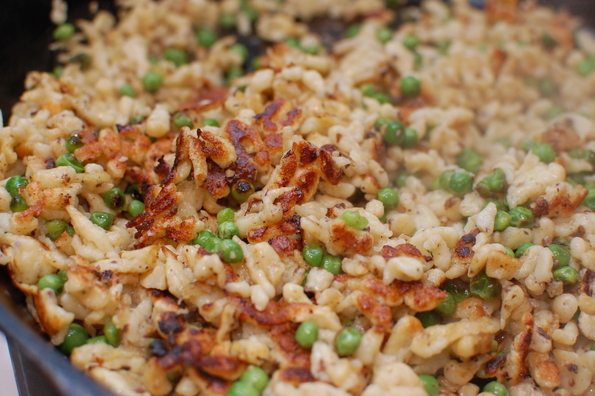 from the bottom of your pan into a frying pan (I used a cast iron skillet), crank the flame to high, and put on top of it several scoops of the spaetzle and a scoop of peas. I suggest somewhere around 3 parts spaetzle and 1 part peas — trust me, the peas are important (I don’t even generally like them). Peas add subtle depth of flavor and sweetness. 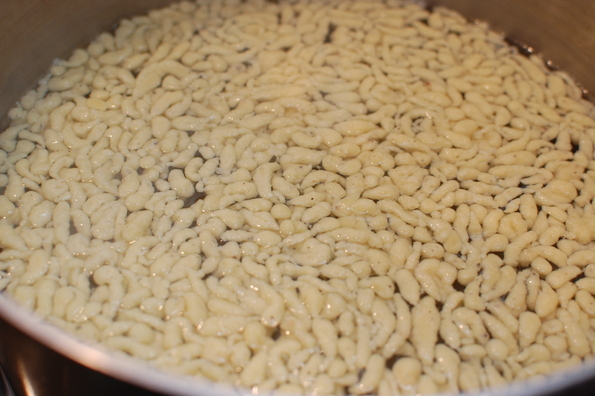 Brown the spaetzle for about 10 minutes — make sure to “flip” the spaetzle every 2 minutes or so to keep it from burning. I used a spatula and just scraped the bottom and flipped. What will eventually come out is amazing — browned, rich goodness. This is why we cook! Make sure to taste it and add salt if needed. That’s it! Carve the duck (watch YouTube if you need pointers), place it on top of the spaetzle, pair with a full-bodied wine, and enjoy! Roasted Duck — I kinda started with this recipe but didn’t really end up following it that much. But it’s a place to begin.